Opus 4 Jazz Club's February concert attracted a full house. And little wonder, with Alan Barnes on the premises! The hugely popular reeds virtuoso enjoys his annual visit to the Traveller's Rest and this Friday evening engagement, working once again with pianist and good friend Paul Edis, would prove to be no different. As Barnes announced the first number - Joy Spring - long-time supporter Dennis arrived, waving regally to one and all. Our guest star is a master of side-splitting one-liners, add straight man Dennis to the equation and you've got the makings of a memorable night of superb jazz and hilarious repartee. 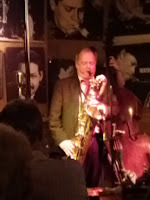 From alto on Clifford Brown's well-loved number - with a cheering audience behind him all the way - to the first of several baritone features on Time After Time, the evening was shaping up as a Gig of the Year contender. Jobim's late-fifties bossa A felicidade found Barnes switching to clarinet on a number which featured towering contributions from Edis and drummer Russ Morgan, the latter showing how it's done with brushes and hands, exemplary musicianship. More clarinet on In a Sentimental Mood* with scribbled notes referring to Edis' 'perfect' solo and a further note - 'wow!' - pertaining to Andy Champion's imperious bass playing. The interval: a dash to the downstairs' bar, the queue a mile long. On the tv, Aston Villa 0 Sheffield United 3, with little more than fifteen minutes to go, game over. 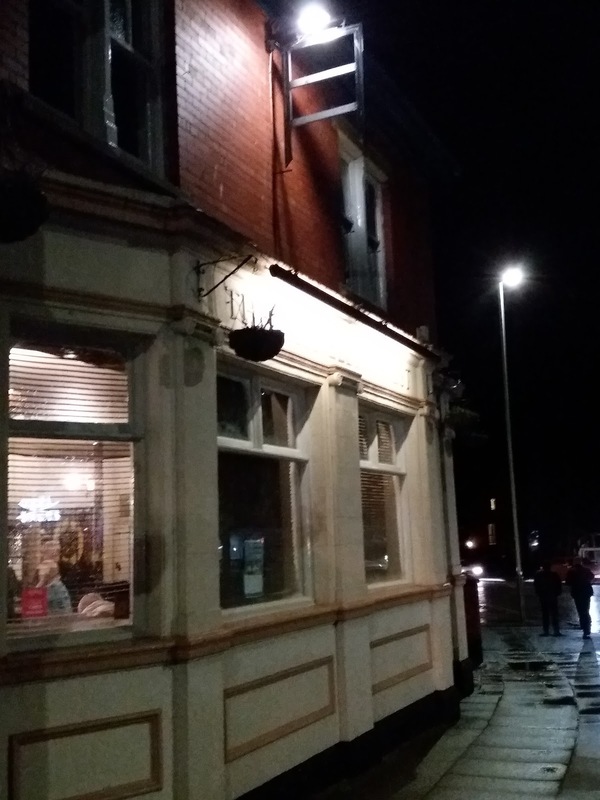 ** Another pint of Young's more than acceptable American-style IPA, the raffle, better luck next time, then back to Mr A Barnes with the Paul Edis Trio. Cole Porter's Everything I Love, replete with quotes, resumed matters with Opus 4's guest once again grappling with his baritone sax. Sticking with the big beast, Barnes and co-found themselves On Green Dolphin Street. No strolling here, this was an eyeballs-out sprint to the finish. Absolutely brilliant, the journey from Newcastle had been more than worthwhile...as if it had been in any doubt! In suggesting Detox Ahead as an alternative title to Johnny Frigo's Detour Ahead, Barnes mused, for a nanosecond, on the possibility of a detox before summarily dismissing such a nonsensical idea! Cedar Walton recorded Bolivia with Bob Berg, Sam Jones and Billy Higgins. Well, here in the Cockerton suburb of Darlington, Messrs Barnes, Edis, Champion and Morgan were more than a match for the illustrious Americans. To close a memorable evening Barnes conducted a straw poll. By popular demand, a blues won out. The late-night journey home was a 'cloud nine' affair. * Earlier in the day Barnes listened to a recording of Lucky Thompson on alto playing In a Sentimental Mood and decided to include Ellington's number in the evening's set list. ** Three Aston Villa goals in the last eight minutes secured an unlikely point for the home team.